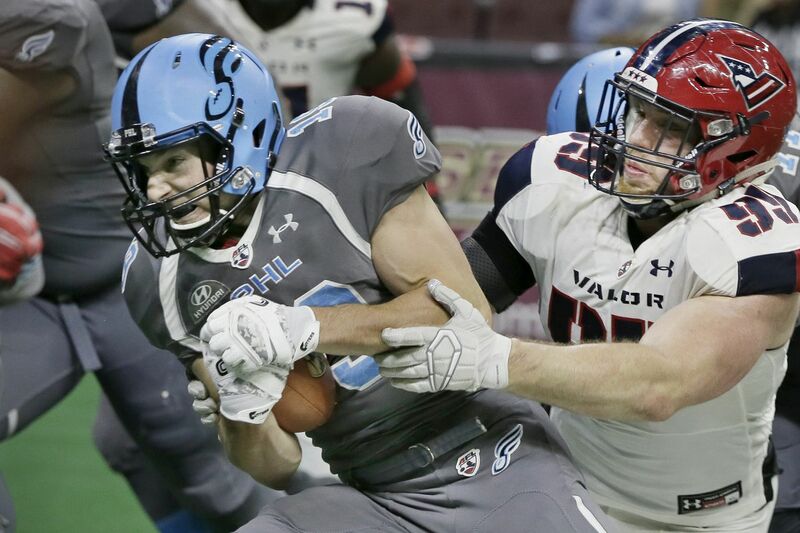 Aaron Wascha shaking loose of the Washington Valor's Jake Payne for a touchdown last month. Two years ago, Aaron Wascha was a high school football coach in Michigan. Today, the 26-year-old wide receiver is a key player in the Soul offense. "I came in and was expected to be a role player," Wascha said, "and I've stepped up, so it feels good." The Soul (7-4) will play at the Albany Empire (7-4) on Saturday (6 p.m., CBSSN) in their regular-season finale with a chance to secure the No. 1 seed in the Arena Football League playoffs. They need a win over Albany and for the Washington Valor (1-10) to beat the visiting Baltimore Brigade (7-4) to gain the top seed. A Soul win and a Baltimore win would give Philly the third seed in the four-team league. The Soul beat Albany, 75-74, in their last meeting on June 16, but Soul coach Clint Dolezel said his team has to play a lot cleaner game this time. "They're a very opportunistic defense," Dolezal said of the Empire. "They make a lot of plays based off your mistakes, so we've got to be clean. Good, clean football and take care of it on our side." Assistant coach John Lyles emphasized how important it is for the Soul to play hard, protect quarterback Dan Raudabaugh and take care of the ball. "We definitely have to play smart football," he said. "We can't be jumping offsides and [have to] stay within ourselves and just play focused football." The 6-foot-3 Wascha is tied with teammate Darius Prince for third in the AFL with 20 touchdowns, including 13 in the last three games. He did not play college football and last year played for the Oakland County Racers in the Rivals Professional Football League, which has teams in Michigan and Florida. Wascha had played football and basketball and run track in high school. He was on Michigan State's track team and competed in the long jump and triple jump. He went on to become a college strength and conditioning coach before becoming a high school football coach. "I missed it [football] and I had a lot of people encouraging me, telling me that I had what it took to make it to the next level," said Wascha, who made the Soul after an open tryout. "I just dedicated myself to a goal, and here I am." Said Dolezal: "He has done it all year long for us. He's been a great special-teams guy even when he wasn't out there in the starting rotation as a receiver. He's only going to improve — especially with as little football as he played in college, which means zero. So he is still learning at a high rate."